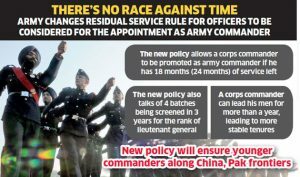 PUNE 29 Dec (PCP NEWS NEW DELHI): The Indian Army has implemented a new policy to tweak the way promotions in the top brass are conducted to ensure more top ranking officers are eligible to reach the highest field commander position — Army Commander. There are 9 army Commanders. The new policy of requiring only 18 months before retirement to become an army commander has given some leeway to corps commanders. Now a corps commander can become an army commander at 58 years and six months of age. “This will ensure that a corps commander can now command his corps for more than a year, leading to more stable tenures,” explained an official. This new policy will also ensure having younger commanders along the frontiers with Pakistan and China, an official said. The new policy allows a corps commander to be promoted as army commander if he has at least 18 months of service left. The new policy allows a Corps Commander to be promoted as Army Commander if he has at least 18 months of service left. This is significant because the earlier rule of having at least 24 months of service left would make most officers overshoot the age bar by the time they meet other requirements to become an Army Commander. NDA ENTRY : From the 1975 batch, the entry level to National Defence Academy (NDA) was increased from class 10 to class 11, which meant a student would be 16 to 17 years when he joins the academy. NDA is for three years and then they spend one year with Indian Military Academy (IMA). So, one used to become an officer at 20-21 years. Now, from 1986, NDA entry level became class 12. So, a student joins NDA at 17-18 years and becomes an officer at 21-22 years. EXISTING POLICY : The retirement age for Lieutenant Generals, including Army and Corps Commanders, is 60 years. To be eligible to command a corps (consisting of about 20,000 troops), an officer should have a residual service of three years at the time of approval. That is, he should not be more than 57 years. For an officer to be eligible to become an army commander (an army command consists of about 60,000 troops) he should have first commanded a corps for at least one year and should have at least two years left to retire. That is, one cannot become an army commander if he has crossed 58 years of age.